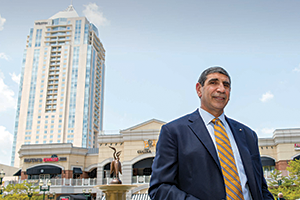 Back in 1999, the area across from Virginia Beach’s aging Pembroke Mall was a “conglomeration of nothing,” says Lou Haddad, CEO of Armada Hoffler Properties. Despite a great location, literally in the middle of Virginia Beach along the city’s busiest road — Virginia Beach Boulevard — the 18 acres across from Pembroke were mostly undeveloped, save for a small office building and a smattering of houses. Built in 1966, Pembroke Mall itself was seeing major vacancies as tenants departed for newer shopping venues. 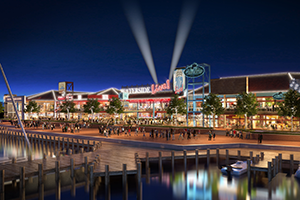 Today this area, known as Town Center of Virginia Beach, is thriving. People mill about at the mixed-use center during the day and night. Events such as a free midweek concert series routinely draw thousands of people to Town Center’s plaza. The 17-block project offers apartments, condominiums and office buildings. It is anchored by a Westin hotel, the Sandler Center for the Performing Arts and 22 restaurants. Across the street, Pembroke Mall has been revitalized by the growth, bringing in new anchors such as Kohl’s and Target. Opened in 2002, the resort city’s town center was developed through a public-private partnership between Armada Hoffler and the city government. Sometimes called P3s for short, public-private partnerships increasingly are being used for commercial real estate projects. Localities are turning to this model, because partnerships help fund critical infrastructure projects, delivering new public buildings and services that generate revenue. In Virginia Beach, for example, the city contributed $83.6 million to the town center, providing public parking garages, the plaza, infrastructure and streetscape features such as fountains. Armada Hoffler invested more than $300 million. The city brings in about $13.5 million in assorted tax income from the center each year. A big chunk of that revenue, $5.2 million, comes from a special Tax Increment Financing (TIF) district set up to repay the city’s debt service on the project. Another $1.5 million in special service district taxes pays to maintain such city-funded features as the parking garage and plaza. The remaining $6.8 million stems from assorted fees such as sales, meals and admissions taxes and business licensing fees. Haddad likes to point out that the center draws retailers unique to the area. “We have the only Cheesecake Factory, the only P.F. Chang’s, the only Brooks Brothers, the only Westin in Virginia Beach. All of those one-of-a-kind facilities are here,” says Haddad, whose company is headquartered in the 23-story Armada Hoffler Tower at Virginia Beach Town Center. “It has far exceeded anything that I had expected … It’s just full of energy,” says Virginia Beach Mayor Will Sessoms. Public-private partnerships can provide win-win scenarios for government and the private sector. They work best, experts say, when three factors are present: the project will be for the public good; it will fulfill a need not currently being met; and it provides a healthy profit potential for business investment. entertainment. Rendering courtesy The Cordish Cos. Still, such projects are not without controversy. Norfolk’s Waterside, built in 1983 under a public-private partnership, nearly went bust 30 years later. The city recently approved a deal with The Cordish Cos. of Baltimore to revamp the waterfront center as more of an entertainment/restaurant venue. While the developer will invest $40 million upfront, the agreement calls for a $1 million public investment for a new marina. The project sustains an iconic waterfront property, but critics note that the city lost money on Waterside for years as it fell into disrepair. As with any project in commercial real estate, “There’s got to be a great guaranteed revenue stream. This is not philanthropy. You want that, go to Bill Gates,” says Rick Norment, executive director of the Arlington-based National Council for Public-Private Partnerships. Public-private partnerships are used for projects ranging from $1 billion-plus toll roads to $7 million parking decks. They frequently are used when neither business nor government could feasibly develop the project independently of each other. “They’re all so very different,” says Chris Lloyd, senior vice president with Richmond-based McGuireWoods Consulting LLC. Projects can differ in financial structuring and the types and amounts of public assistance, among other factors. In the commercial real estate sector, public-private partnerships differ vastly from large public works projects. Investors and governments, for example, may wait 50 to 75 years to recoup their money on some toll roads. “On commercial real estate projects,” however, “you’ve got to recoup it on a much tighter time frame” because private developers are looking for shorter windows to gain a return on their investments, Lloyd says. Typically, real estate projects under public-private partnerships move faster than usual government development projects because the design and construction processes are not solicited separately. Developers are motivated to deliver projects more quickly by desire for profit and economic incentives built into contracts for early completion, Lloyd says. Having a public partner, however, makes a deal “more credit-worthy” in the eyes of banks and investors, making it easier for developers to obtain funding for large real estate projects, Lloyd says. Public-private real estate partnerships are formed for many different reasons. In Richmond, for example, the city is investing nearly $14 million in taxpayer money for a new, 18-story office tower downtown. The city investment includes $11.2 million to help finance a 506-space parking garage for the $110 million Gateway Plaza, which will be the new headquarters of law firm McGuireWoods and its consulting arm when completed in 2015. The city would get nearly a 65 percent ownership interest in the garage, expected to cost about $22 million, and 326 public spaces. The city also will give the developers, Chicago-based Clayco, a $3 million performance-based grant to be paid by new tax revenue expected from the tower, which will include 14,000 square feet of retail space. Currently housed in One James Center, McGuireWoods was considering leaving the city when its lease expired in 2015, says Richmond Economic Development Director Lee Downey, a former marketing manager for the law firm. One of the nation’s largest firms, McGuireWoods employs 630 attorneys, staff and consultants in Richmond. “Through this project with the developer, we were able to retain an important business in the city of Richmond,” Downey says. The city also will gain some new real estate tax revenue from the project that incrementally will repay the debt service for the parking deck. As for the developer, Larry Chapman, principal of Clayco Real Estate Services, says the project wouldn’t have been profitable or feasible without the city paying for the parking garage. “The cost of the deck for that garage was more than the rent you could get” for the spaces, he says. In Fairfax County, the county government and Reston-based developer Comstock Partners have entered into an innovative partnership on the $750 million Reston Station project, part of the $6 billion Silver Line Metro extension to Washington Dulles International Airport. The county will provide $87 million toward construction of a $91.3 million, 2,300-space underground parking deck at the largely underground metro station along Wiehle Avenue. The project also will include a commuter park-and-ride facility and a transit bus depot. On the nine acres above the Reston Metro station, Comstock is developing a 1.3 million square-foot, mixed-use center that will include 900 luxury apartments, a 200-plus-room hotel, restaurants and office and retail space. In Hampton Roads, Virginia Beach developer Bruce Thompson, CEO of Gold Key/PHR Hotels & Resorts, has been leading some major public-private partnerships. Currently on his plate is a $126 million Hilton hotel and conference center in downtown Norfolk, which is expected to get underway in January, and the $259 million renovation and expansion of the historic Cavalier Hotel property in Virginia Beach. Norfolk’s share for the hotel/conference center is $89 million — or more than half the total cost — and includes $16 million already spent to clear land at Main and Granby Streets. The project has been controversial. Naysayers contend that the conference center market already is oversaturated at a time when many companies and the federal government are cutting back on conferences in response to a slow-growing economy. Supporters say the center would have a bigger ballroom than existing facilities, giving Norfolk the capacity to host more than one major conference at the same time. In the case of the Cavalier, Thompson’s firm is investing more than $225 million to renovate the storied hotel. It fell into disrepair after a protracted legal dispute among family members of the property’s owner, The Disthene Group. The city government wanted the iconic property restored rather than seeing it razed to make way for condos or apartments, as some developers had proposed. To help make that happen, Virginia Beach offered $18 million in economic development funds and tax rebates if a developer would restore the hotel and its surrounding 22-acre property, which includes another hotel. Thompson, who acquired the Cavalier in bankruptcy court for $35.1 million in July, was the only bidder interested in renovating the hotel. He expects the project to take about three years. The cost to build a new hotel would have been about $150,000 to $200,000 per room, compared with $525,000 per room to renovate the 86-year-old Cavalier, Thompson says. “There is no earthly way that anyone would have restored, maintained and redeveloped that property without the use of a public-private partnership,” he adds. Thompson can cite a successful track record with public-private commercial real estate projects. In 2003 he developed the then-controversial $79 million Hilton Virginia Beach Oceanfront Hotel on a publicly owned oceanfront park on 31st Street. The city invested $32 million for a parking garage, park space and land. The 21-story hotel project has brought numerous conferences to the city, Thompson says, and it spurred additional nearby development, including a mixed-use office, retail and residential complex and Thompson’s own $250 million Ocean Beach Club, built without public support. After paying debt service, the city clears about $2 million per year in tax income from the property, says Virginia Beach Mayor Sessoms.